The beginnings of Wrocław are connected with a settlement that developed at a spot convenient for crossing the Oder River, at a crossroads of important and old communication trails coming from Southern Europe to the North, to the Baltic Sea and from the West to the East, to the region of the Black Sea. In the first half of 10th century, the territory of Silesia came under the reign of Bohemia, and the settlement, at that time surely having the nature of a frontier city, most probably obtained the name after Bohemian Prince Vratislaus. In the last decade of the 10th century, Silesia was included within the Polish borders. In 1000, during the reign of Bolesław I “the Valiant” (Bolesław Chrobry), a papal edict came out – the oldest preserved, written mention about Wrocław, which set the city as the seat of the Wrocław bishopric, subordinate to the Archbishopric of Gniezno. During the period of fragmentation in Poland, Silesia and the largest of its cities became the domain of a new line of princes – the Silesian Piasts. Numerous settlements arouse around the ducal city located on the Oder islands. At the beginning of 13th century, they started gradually transforming into one city organism. This process sped up after the Mongol invasion of 1241, during which Wrocław itself was also partially demolished. The city was rebuilt based on German law. At this time, the German colonists that took over a domineering role among the citizens were encouraged by the Silesian Piasts to settle in Silesia, who hoped that it would support the process of rending their lands habitable. In the second half of the 13th century, the city already had brick city walls and a moat. In 1261, in compliance with the Magdeburg Law given to Wrocław, a government body took over managing the city – the City Council. In 1335, after Prince Henry Piast died leaving no descendant, the city and Wrocław duchy came, by previously signed agreements, under the rule of the Bohemia crown. The period of staying under the rule of Luxembourgers generally favoured the development of the city, becoming a more and more important centre of trade and craft. The period of Hussite Wars and later, long years of fights for Bohemia succession after the Luxembourg Dynasty died out, turned out to be less favourable for all of Silesia and Wrocław. Finally, in 1526, after the death of Louis II of Hungary, the King of Bohemia, Wrocław and Silesia came under the rule of the House of Hapsburg. It also ended the period of trying to restore Polish control over Silesia. A rich city with a large territory, at the turn of 15th and 16th century, it started building modern fortifications, proper for upcoming era of firearms. 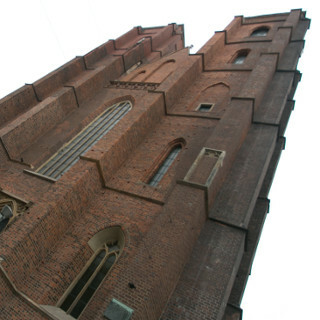 In 1523, together with the sermon preached by Johann Hess at St. Mary Magdalene Church (kościół Świętej Marii Magdaleny), the reformation reached Wrocław, where it found a susceptible foothold. As soon as a year later, a majority of citizens, with the City Council taking the lead, adopted the Protestant faith. Only the temples and monasteries of Ostrów Tumski and some of the nearby settlements turned out to remain Catholic. The absolute dominance of Protestant faith was to remain stable throughout the following centuries, and this was not undermined even during the period of attempts to re-Catholicise Silesia by the Habsburgs in the first decades after the Thirty Years' War ended. Furthermore, the city managed to avoid mayor damages during this war thanks to the attempts to preserve neutrality towards parties in the conflict. In 1702, Tsar Leopold I established a two-faculty university in Wrocław – the Society of Jesus Academy (Akademia Jezuicka). As a result of Silesian wars, starting from 1741, Wrocław and Silesia came under Prussian rule. Wrocław citizens greeted the army of Frederick II with enthusiasm. Soon, the Prussian king made the conquered province “an armoury” of the country, and its capital city – Wrocław – one of three capital cities and also a stronghold. At the same time, the centralistic Prussian policy deprived the city of the self-governance that it had had since medieval times. The increased fiscal pressure imposed by the new power, which was only to some extent balanced with efficient administration, was also visible. In January 1807, the city capitulated to Napoleon’s armies, which had conquered the Prussian armies in the field. French occupation brought a significant contribution and the demolition of municipal fortifications. Therefore, unintentionally, the French contributed to lift the barriers in the city’s spatial development that took place after the Napoleonic wars. Starting from 1809, Wrocław, together with other Prussian cities, obtained, as a result of thorough reforms carried out in the country, a modern municipal self-government and conditions for unrestricted economic development in capitalist conditions. In 1811, a public higher school - the University of Wrocław (Uniwersytet Wrocławski) was established, whose greatest period fell at the turn of 19th and 20th century. In the 19th century, the capital city of Silesia, especially in its last decades, became not just an important centre. Starting from 1842, when the first section of iron railway was opened (Wrocław – Oława), the city gradually became an important junction, crossroads and, after serious regulatory works on the Oder River and building a port at Popowice at the turn of the 19th and 20th century, also a floodway system. The city was continuously developing, growing and modernising its infrastructure as well as construction resources. In 1877, the first horse-drawn tram lines were activated, which operated until 1910, and from the 1890s, together with the electrification of the city, they were gradually replaced with electric trams. Academic life. Next to the University of Wrocław, which back then had already given several Nobel Prize Winners, in 1910, the Higher School of Technology (Wyższa Szkoła Techniczna) was established, and a year later – the Academy of Fine Arts (Akademia Sztuk Pięknych). Theatre and musical life and, to some extent, fine arts made Wrocław one of a handful of the most important cultural centres in Germany. In first decades of the 20th century, outstanding and absolutely innovative architectural works appeared in the city. The city had over half a million citizens. The importance of the growing richness of the frontier-city was reflected in the continuously growing number of foreign diplomatic representatives that were locating their seats in Wroclaw. In 1914, there were as many as 20 of them. During the first World War, Wrocław, lying outside the frontier zone, avoided damage, though of course, this did not prevent impoverishment of the people and the city’s economy. After the war, new economic problems caused Germany some territorial losses to the benefit of Poland, which brought about diminishing direct storage of the city. In first two post-war years, Wrocław was also an arena for rather dramatic events connected with establishing a new political order in Germany. After the political and economical situation in Germany stabilised, in the second half of the 20s, Wrocław re-entered the path of development and modernisation. During the years 1924 – 1928, it enlarged its administrative borders’ framework significantly. It regained its position as an economic and cultural centre. Satellite residential estates that were established back then have been considered very successful and innovative even today: Popowice, Sępolno, Biskupin, Pilczyce, Muchobór, Grabiszynek, Książ Mały and Wielki, built with a view to unburden the overpopulated suburbs. The development of the city was hindered after 1929 by a huge economic crisis. After 1933, industry and infrastructure investment of national-socialist authorities brought about, as in whole Germany, economic growth in the city once again and contributed to a significant decrease in unemployment; however, at the same time, the autonomy of the city was significantly restricted. Wrocław was developing back then as a wheel in the machine of Hitler’s country, which was arming itself to conquer the world. Cultural and academic life was significantly restricted. Continuously growing terror was used against political opponents and Jewish people, which finally turned into extermination. After the outbreak of World War II, until 1944, Wrocław remained outside the area of direct military operations and even became a shelter for a few hundred thousand civilians evacuated from deep in Germany and for numerous arms industry plants. At the end of 1944, the number of persons staying in Wrocław increased to almost a million. In 1944, in view of the approaching eastern front, Wrocław was announced a closed fortress. In January 1945, the command of the fortress ordered the forced evacuation of civilians, in conditions of an incredibly cold winter and shortages in transport means, which was tragic in its consequences. In February 1945, the city’s siege by the Red Army began. After almost 3 months of fighting, "Festung Breslau" capitulated on 6 May 1945. A majority of its construction substance was ruined, especially the southern and western districts of the city. The dozens of thousands of defenders and civilians that stayed in the city died or were seriously wounded. A few days later, the first representatives of the Polish administration began coming to the city. The rebuilding process of the demolished city, the inflow of Polish people and displacement of German people began. These last ones were done pursuant to the provisions of the Potsdam Conference, where it was decided to give Wrocław and Silesia to Poland and to displace the German people. In the difficult first post-war years, apart from the Polish administration, the city was also governed by a military Soviet administration, whose policy was not always compliant with Polish interest. In autumn 1945, the first offices, municipal communication lines, schools (Polish University of Wrocław on 15 November), press, cultural and sports institutions were opened. Services and trade, which were mostly private, also developed. Among the Polish people coming to Wrocław, the inhabitants of central Poland and Greater Poland (Wielkopolska) were dominant. Inhabitants from the Borderlands (Kresy), especially from Lviv, also constituted a visible group. Together with them, a part of the Ossolineum collection and the Panorama of the Battle of Racławice (Panorama Racławicka) canvas, which are very important for the national culture, were imported from Lviv to Wrocław. When the communists, after obtaining full power, in 1948 started forcing communisation of the society, country and economy, the concerns and consequences of this policy were also fully felt in Wrocław. The communist authorities treated Wrocław and the recently conquered western and northern lands in an ambivalent way. On the one hand, they claimed e.g. merit for regaining these lands by Poland and boasted about successes in rebuilding the lands and integrating them with the rest of the country. Large propaganda events were organised, e.g. : The Recovered Territories (Ziemie Odzyskane) exhibition (July 1948) and the World Congress of Intellectuals in Defence of Peace, attended by delegates from 46 countries. On the other hand, throughout long years, the technical and material resources of Wrocław were treated as a reservoir for the lands of central Poland. Even after restricting this type of policy at the end of the 50s, in the following decades, Wrocław rarely found itself on the list of investment priorities of the country. Some of the neglects of that time, e.g. in the sphere of the communication infrastructure, have had consequences up to the present. At the end of the 50s, the city regained its former population potential irrespective of the restrictions and deformation resulting from the political and social-economical conditions of the times of The People's Republic of Poland (PRL). It found its place and became one of the most important city centres for economy, culture and academics in the country. Especially, local heavy industry – metal, machine and transport means, developed significantly. New generations of Wrocław citizens found more and more frequently (though, never in sufficient numbers) flats in newly built residential estates that, since the 70s, have been dominated by so-called panel building. Post-war Wrocław was one of the youngest in respect of the age of citizens in comparison with other cities and towns of Poland, and the city was distinguished by the significant percentage of youth and students. 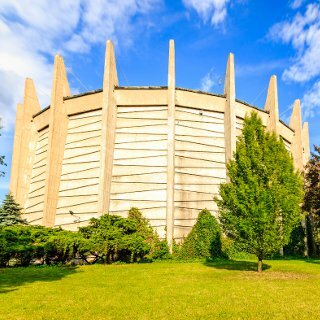 At the turn of the 60s and the 70s, Wrocław became one of the most important cultural centres of the country, known, among others, for the Festival of Oratorio-Cantata Music (Festiwal Muzyki Oratoryjno–Kantatowej) „Wratislavia Cantans”, the achievements of the Henryk Tomaszewski Mime Theatre (Teatr Pantomimy Henryka Tomaszewskiego), Jerzy Grotowski Laboratory Theatre (Teatr Laboratorium Jerzego Grotowskiego), Wrocław artistic environment and the rich student culture. In August 1980, Wrocław employment establishments joined common strikes on-going in the country, which led to the establishment of the Independent Self-governing Trade Union (Niezależny Samorządny Związek Zawodowy) „Solidarity” (”Solidarność”). The Lower Silesian region and Wrocław itself became one of the largest strongholds of „Solidarity” („Solidarność”). Also after introducing the restriction of a martial law, Wrocław remained throughout the 80s one of the strongest centres of anti-communist opposition. In June 1983, Wrocław was visited by Pope John Paul II during his pilgrimage to the country, who met with almost a million Wrocław citizens and Lower Silesian inhabitants that came to the city and attended Holy Mass held at the horse race track (Tory Wyścigów Konnych) at Partynice. 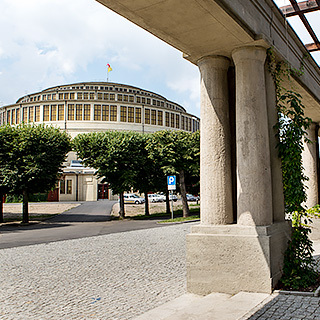 In 1985, for the first time after war, in Wrocław, the renovated Panorama of the Battle of Racławice (Panorama Racławicka), which was placed in a special pavilion, was rendered accessible, and immediately it became one of the most important touristic attractions of the city. In June 1989, Wrocław citizens massively took part inthe first free elections to the Seym and the Senate , which gave rise to systematic changes that, by introducing Poland to a path towards democracy and a market economy, opened new, not seen for decades, opportunities for the city’s development. In May 1990, the first free elections to self-government took place. The City Council was established, and Prof. Stanisław Miękisz became the first Chairman. The Council chose Bogdan Zdrojewski as the President of Wrocław. One of the first moves of the City Council was to restore the historic coat of arms of Wrocław, which turned out to be a symbol of contemporary Polish citizens accepting Wrocław’s, as well as the German, past. Under the new conditions, Wrocław, as with the rest of the country, underwent transformation in basically all areas. In economic life, private entities shortly replaced former large public establishments, the majority of which, in these new conditions, were subject to privatisation or liquidation. The structure of Wrocław industry changed, and at present, it is mainly focused on motorisation, pharmacy and new technologies. The modernisation of the Wrocław industrial centre is favoured by a precipitous development of higher education, providing for qualified staff, which has continued since the middle of the 90s. The rapid economic development of the city broke through the barrier of long-lasting infrastructural neglect, both in the city itself, and within the region and entire country. 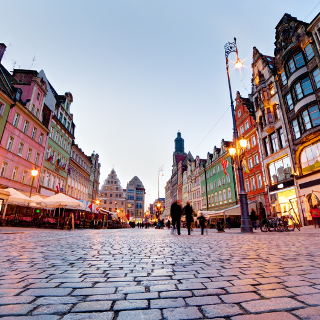 Over the past several years, the municipal authorities have done a lot to give one of the largest cities in Poland the features of a metropolis. It is one of the country’s leaders in attracting foreign investment. This is accompanied by thorough modernisation of the communication system. The municipal architecture has been continuously revitalised. The transformation of Wrocław is happening not only in the material sphere, but also in the mental - in the awareness of its citizens. A feeling of identity with the city is developing, and Wrocław is becoming a meeting place for visitors from around the world and an organisation spot for international events such as the European Youth Meeting from Taizé in Wrocław (1993), the 46th International Eucharistic Congress with the participation of Pope John Paul II (1997) and the solemn celebration of the Millennium of Wrocław (2000). 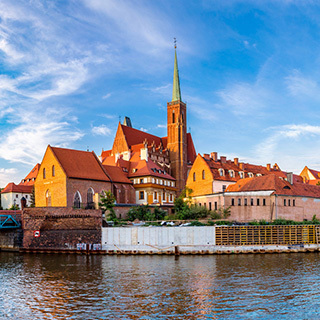 Furthermore, Wrocław became a member of several international organisations and started partner cooperation with a few European as well as Northern and Southern American cities. In September 2001, Stanisław Huskowski became Bogdan Zdrojewski’s successor as President of the City. He was replaced in November 2002 by Rafał Dutkiewicz – the first President of Wrocław elected in common elections.